With his geometric structures perched upon the hillsides, beaches, and deserts of California, John Lautner (1911-1994) was behind some of the most striking and innovative architectural designs in mid-20th-century America. 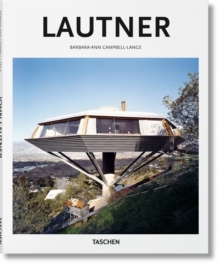 This introductory book brings together the most important of Lautner's projects to explore hishis ingenious use of modern building materials and his bold stylistic repertoire of sweeping rooflines, glass-paneled walls, and steel beams. From commercial buildings to such iconic homes as the Chemosphere, we look at Lautner's sensitivity to a building's surroundings and his unique capacity to integrate structures into the Californian landscape. With several of Lautner's houses now labeled Los Angeles Historic-Cultural Monuments, we'll also consider the architect's cultural legacy, as much as his pioneering of a visual paradigm of 1950s optimism, economic growth, and space-age adventure.